Formerly an important city (often mentioned by the Arabic geographers of the ninth and tenth centuries in connection with the invasions of the Russians in 880, 910, 914, and 943), now a Tatar village on the Terter river, in the district of Dzhevanshire, government of Elizabethpol, Transcaucasia. 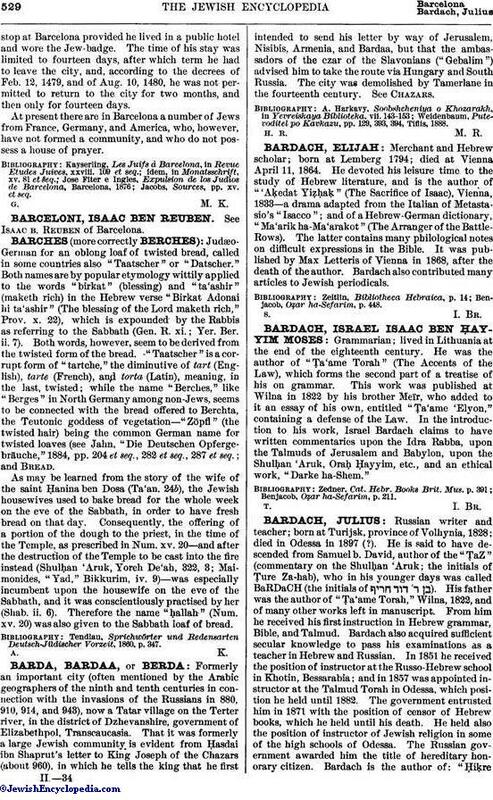 That it was formerly a large Jewish community is evident from Ḥasdai ibn Shaprut's letter to King Joseph of the Chazars (about 960), in which he tells the king that he first intended to send his letter by way of Jerusalem, Nisibis, Armenia, and Bardaa, but that the ambassadors of the czar of the Slavonians ("Gebalim") advised him to take the route via Hungary and South Russia. The city was demolished by Tamerlane in the fourteenth century. See Chazars. Weidenbaum, Putevoditel po Kavkazu, pp. 129, 393, 394, Tiflis, 1888.